City had been aiming to complete a €56 million (£50m) deal to sign Jorginho, with De Laurentiis confirming he has accepted an offer from the Premier League champions. 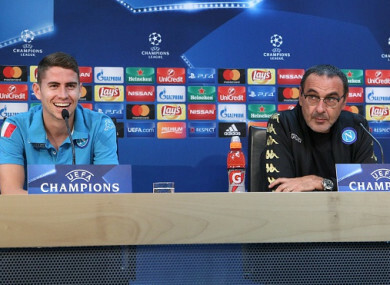 However, City have yet to get the deal over the line and it now appears that Jorginho could instead follow his former Napoli coach Sarri to Chelsea, who are set to pay a combined fee of €58m (£51.3m) plus €7m (£6m) in add-ons for the pair. “I accepted Manchester City’s offer 15 days ago, but I have to apologise to them,” said De Laurentiis at a press conference to present Ancelotti as Napoli’s new coach. Brazil-born Jorginho had been left out of Napoli’s pre-season training camp, while the club have already signed Spanish midfielder Fabian Ruiz in a reported €30m (£26.5m) deal from Real Betis to replace him. Email “Chelsea nearing €58m double swoop for outgoing Napoli boss Sarri and midfielder Jorginho”. Feedback on “Chelsea nearing €58m double swoop for outgoing Napoli boss Sarri and midfielder Jorginho”.